Tree pruning in Bakersfield, CA is different from trimming for a variety of reasons. While Bakersfield tree trimming is aimed at keeping humans and human property safe, tree pruning in Bakersfield, CA is aimed more at keeping trees happy and healthy. Typically this is done during the dormant seasons, so leaves and buds aren’t contending with the process. Generally, tree pruning in Bakersfield, CA performed by the skilled arborists at Arbor Tree Care is aimed at removing excess growths that could impede the overall growth of the tree. This includes low hanging branches that take away air circulation from the crown of the tree as well as eliminating sick, broken, or malformed branches that can impact the overall growing conditions. Generally you want the growing framework to remain around the same areas throughout the tree’s lifespan, meaning that “slow growth” should be encouraged, and vigorous upright shoots should immediately be trimmed back knowledgeable and experienced arborists. It may seem counterintuitive to have to “cut back” a tree to allow it to grow more, but letting the growth go wild does more harm to the tree than good. It weakens the branches, which in turn weakens the tree. Also, more branches around the core means less sunlight and oxygen allowed to pass to the crown of the tree. It’s essential to allow the crown to get some fresh air, in order to protect your tree from certain fungi and diseases. This is something that our skilled tree service Bakersfield, CA representatives excel at providing. 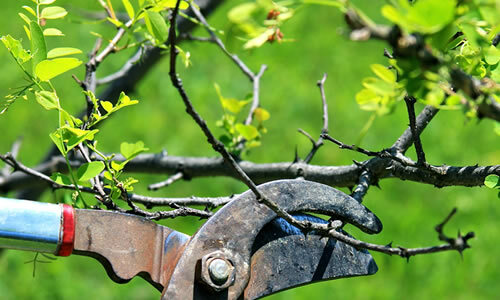 Tree pruning in Bakersfield, CA is essential to keeping you tree happy and healthy. And studies show that properly, regularly pruned trees do in fact live longer than those in the wild forests. Clearing away the excess growth and unnecessary branches will ensure your trees grow up tall and strong. So call (661) 426-2117 now for the best tree pruning Bakersfield, CA has to offer.